The King Solomon Hotel Hotel is located conveniently on the corner of King David and Keren Hayesod Streets, within easy walking distance of the Old City, City Center, Mishkenot Shaananim neighborhood, First Station and much more. The hotel is well equipped with dining and event facilities, and the rooms are comfortable with great views of the city. 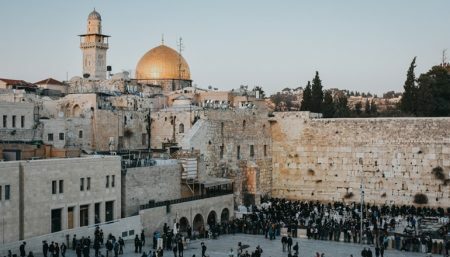 The hotel features a range of 148 rooms, a swimming pool that’s open in the summer months, several dining options, a selection of shops, a business center with internet access, and a synagogue where daily prayers are held. The King Solomon offers a great location for exploring Jerusalem. It is within walking distance of Jaffa Gate, Ben Yahuda street, and the old market. It is also directly across the street from a park/garden area. Helpful staff and clean areas. The hotel is a bit old, but recommended. It was nice to visit the Holy Land and find American money is preferred by the businesses. But I would stay elsewhere next time. The hotel looks awesome as you enter, but this is deceiving. Rooms are very small and inconsistent in decor, size and cleanliness. We were here with a large group and all complained of different things. Did find that there is no a/c during March, not good when it is hot and you are tired. Restaurant food was good the first day, but every day is the same thing. Elevators are slow and small, use the stairs if time is an issue. This hotel is well situated and you can reach the Old Town within five minutes by car or it’s a very pleasant 15 minute walk away through the park on the opposite side of the road. It’s also a close walk from the trendy Station development of restaurants and the indoor pool at the YMCA. The King Solomon has a brand new gym and an outdoor pool, open during summer months. The decor of the bedrooms is a tired but they are very large and most have good views. The hotel food is excellent with a large selection for breakfast including freshly made omlettes. In the evening, the buffets are of an unusually high standard. The hotel’s staff are very friendly - particularly those in the restaurant and bar. I loved the piano playing each evening. There’s an excellent shop in the King Solomon called Jolani Jewellery which is an excellent alternative to braving the souks and offers a bespoke ring making service.